Ok, so it's not technically a beauty item but I'm hoping that I can get away with sharing this new discovery with you as it falls under the "health" category, plus I'm absolutely hooked! I eat reasonably healthily but my downfall is definitely snacking- I have a real sweet tooth along with a deeply ingrained tendacy to snack on savories purely to have something to do with my hands whilst working. Graze.com has come to the rescue with their clever snack boxes, delivered for just £3.49 a week. It's easy to sign up and order. Simply choose the box you'd like, I chose the Nibble box which enables you to choose from the widest selection although there are healthier options, then enter the date you'd like to receive your snack boxes which is usually a couple of days ahead. Choose where you'd like your box delivered- either home or your place of work & note any allergies. I really like that you can quickly "bin" items which you don't like/ are allergic to so that you're never sent them. It's such a clever scheme, enabling you to vary your snacking with healthy opinions in portion controlled packs (I'd say you receive about a handful in each tub, with four different tubs in each box). I really like that there are full ingredients listings on the site and nutritional information in the box. 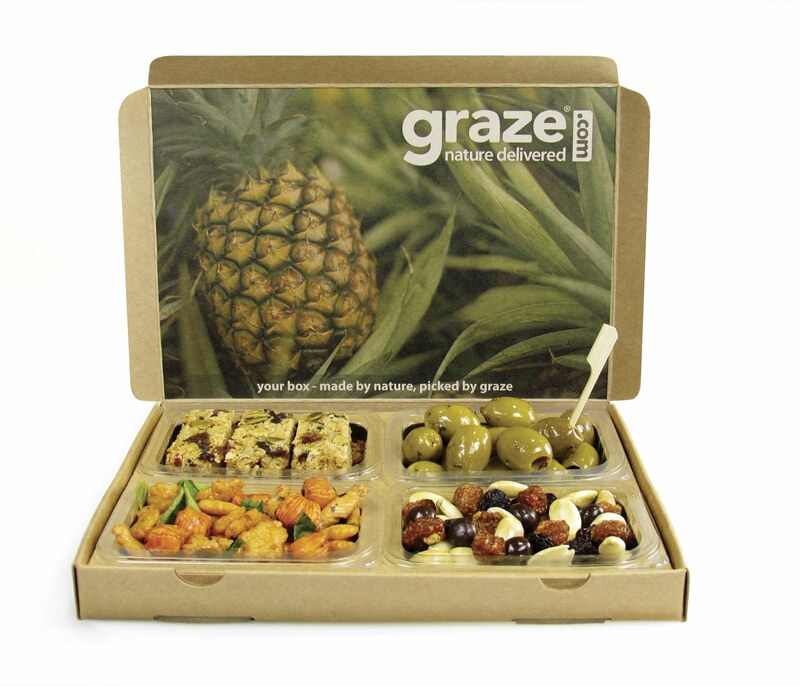 Once you'd received your box of snacks you can rate items so that Graze.com can monitor your likes & dislikes. Although it seems a shame that there are only four tubs, rather than five, I like the idea that you can have a treat day if you're using the scheme for dieting purposes. I've been using Graze.com for three weeks and have so far received delicious snacks including olives, flapjacks, vanilla seeds, as well as nuts mixed with dried fruit & pieces of fudge to taste like desserts. I'm super impressed- why not give it a go?